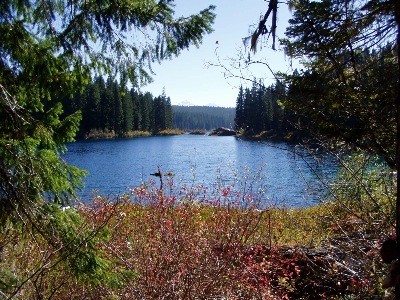 This course is taught at Clear Lake, Oregon, on the Mackenzie Pass, at an altitude of just over 3,000 feet. 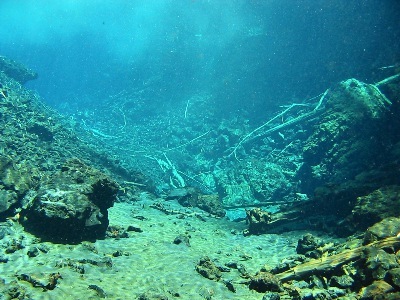 This lake features the best visibility west of the Mississippi --- and underwater trees, still standing, that are over 3,000 years old! 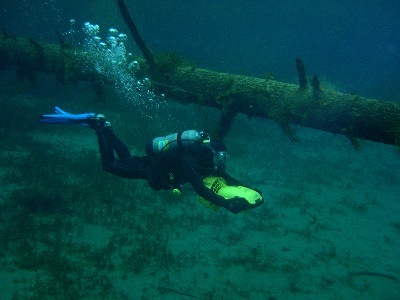 Every 1,000 feet in elevation requires a different set of dive tables! 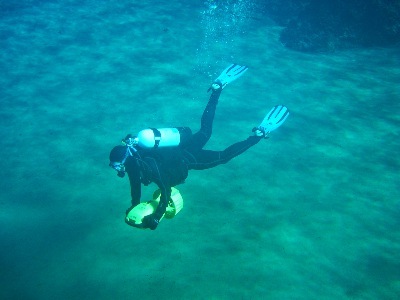 A diver who is unaware of this and dives at altitude can run into a series of fatal consequences. 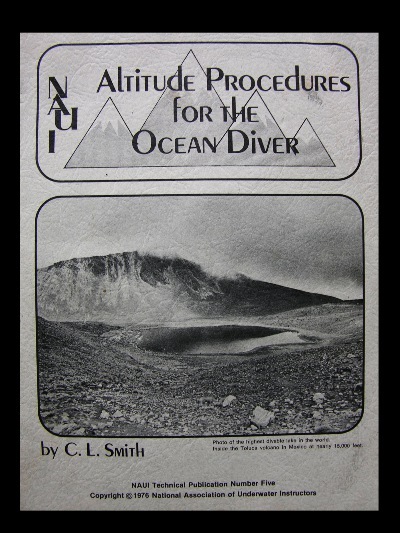 The NAUI ALTITUDE DIVER Specialty Course teaches you how to safely dive at ANY elevation, and you have a lot of fun in the process! The white spot you see near the top of this photo, close to the center, is over 600 feet from where the photo was taken! 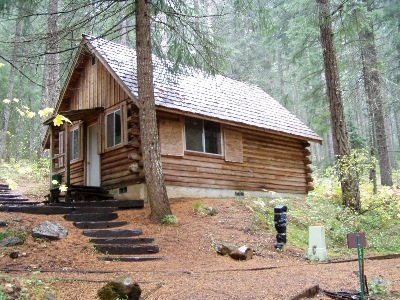 The accommodations are rustic cabins close to the lake. You can cook in the cabins or dine at the restaurant next to the lake. The food is great and not expensive at all. One of the preserved trees, over 50 feet in height. 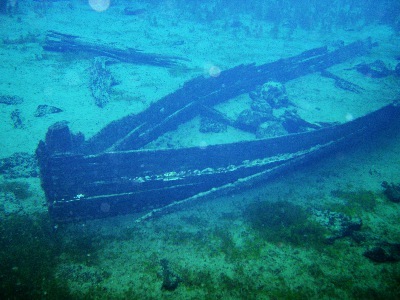 Preserved boat from the 1940s. No outboard motors or electric motored boats are allowed on the lake at any time. Kayaks, canoes, and rowboats only! Because of this, Clear Lake maintains a quiet, peaceful atmosphere. 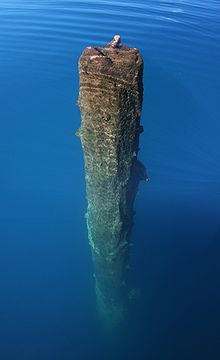 The diver in this photo is 22 feet deep. 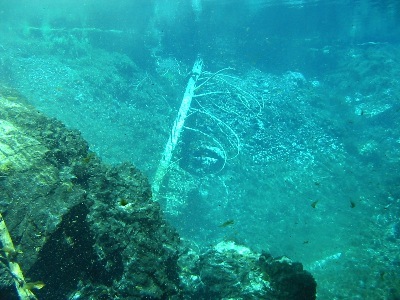 The bottom below him is at a depth of 60 feet! Underwater, you can cover the greatest distance with a DPV (diver propulsion vehicle) and doing so in this kind if visibility is like flying! The tree in this shot is over 600 feet from where the photo was taken, and is close to 100 feet in length! In this course, you'll arrive Friday. On Saturday, you'll make 3 dives. On Sunday, you'll make 1 dive. 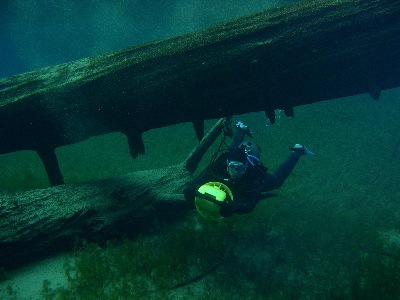 Cruising under some big timber! Water temperature is 35 to 40 degrees. 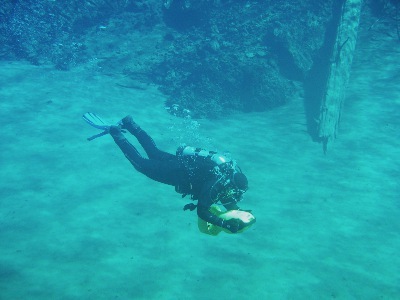 While a dry suit is highly recommended, several divers have done these dives with wetsuits. Your choice!